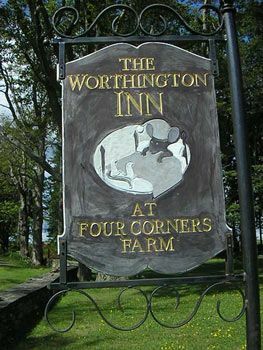 The Worthington Inn at Four Corners Farm is a special place – a quaint eighteenth-century tavern situated on a 15-acre working farm. The Inn is a cornerstone of its town, the charming New England village of Worthington. Centrally located in the hills of Hampshire County on the east side of the Berkshires, the bed & breakfast is a wonderful place to host your wedding or retreat, or just to stay for a relaxing night or two. The Inn offers easy access to Springfield, Williamstown, Pittsfield and the five college area of Amherst and Northampton. Surrounding our farm is a tapestry of pastoral splendor – miles of wooded hills and cornfields into which our fields are woven.